Have you been involved in a collision with a commercial truck in Albuquerque? Your injuries demand justice and compensation. Here to see you get exactly that is an Albuquerque semi-truck crash attorney with Will Ferguson & Associates. If a truck driver has injured you, you may be contemplating whether to file a claim for compensation. If you’ve been hurt and you have damages, you’re likely eligible for compensation. Negligent truckers and trucking companies should be held accountable when they’ve caused other people’s injuries. Your injuries may be serious. You could be dealing with huge financial losses. You may be overwhelmed by physical pain and stress following your accident. At the end of the day, you deserve justice in the form of monetary compensation for all you’ve been put through because of another person’s careless or reckless actions. Filing and winning a personal injury case isn’t easy, though. It requires a deep knowledge of New Mexico’s negligence laws, and you’ll need investigation skills so the cause of your accident and fault can be proven. Fortunately, you can get the legal help you need by working with an Albuquerque truck accident attorney at our firm. When you’ve been hurt in a truck crash, the reason you’re able to sue a negligent party for damages is because of the legal concept of negligence. When someone’s careless actions cause you to be injured, they can be held legally responsible for your damages. For instance, if you were sideswiped by a semi-truck, you can sue the trucker and sometimes the trucking company to receive compensation for your resulting damages. In New Mexico, even if you are found somewhat responsible for your injuries, you can still file a claim against other involved parties for the role that they played in your big rig collision. In some cases, multiple parties could be to blame for your accident. This is especially true with trucking accidents because of the commercial aspect of transportation services. A trucking company will often be liable for the actions of its drivers. To give you an idea of when you can pursue compensation even if you were partially to blame for the accident, let’s look at an example. Let’s say you were driving when a semi-truck crashed into you. You are assigned 20 percent of the blame for the accident because you were eating while driving, and the trucker is assigned 80 percent of the blame because of drowsy driving. You can still file your claim against the trucker and possibly the trucking company, but your damages will be reduced by 20 percent because of your part of the blame. This concept is known as comparative negligence. Many big rig crashes are caused by human error, and that means that, more likely than not, someone was to blame for your accident. Even if the weather played a role in your accident, it’s still possible that the commercial truck driver wasn’t driving at an appropriate speed for the weather conditions. A lot of different factors can work together to cause a collision, but some of the most common are due to a negligent party’s actions. For example, if a truck driver was working too many hours and chose to drive drowsy, that can be considered driver negligence. You can sue the driver and the trucking company—if you can prove it. Now you know what could have caused your accident, but how do you prove it? Your 18-wheeler crash lawyer in ABQ must investigate your accident and find the evidence that proves fault. Once you prove fault, you can file your claim with the at-fault parties or their insurance company. Once your Albuquerque semi-truck wreck attorney has collected evidence, it then becomes necessary to file your claim paperwork. It’s important to get all of the steps exactly right so your claim won’t be rejected for picky errors. There are a few reasons why you may want to file a claim for compensation after a semi-truck accident. One reason is to obtain justice when someone has done you wrong. Another reason is to prevent the negligent or reckless party from hurting someone else. Finally, you probably want to file a claim to receive monetary compensation for your financial and non-financial damages. Financial damages are all of the losses you’ve faced that are directly tied to money, such as lost work wages. Non-financial damages are the other ways your accident has affected your life, such as pain and suffering. Many people don’t consider that the severity of their injuries will impact the compensation they can receive. If you sustain a very minor injury in your accident, you won’t likely have a lot of damages. Conversely, the more serious your injuries are, the more damages you’ll be dealing with. For instance, if you suffer a broken bone, you could be recovering from your injury for months—sometimes years. This can lead to a lot of missed income. In some cases, a broken bone can even cause injury and mobility issues for life, and you could be dealing with pain and suffering. This can affect your entire future. You deserve to be compensated for your serious injuries. Serious injuries will raise the overall value of your claim because your damages are likely to be greater. Semi-trucks are enormous vehicles, and a collision with one of them is likely to leave you with devastating injuries and substantial losses. You may be dealing with crippling medical bills, lost income, pain, and emotional trauma after such a wreck. Your truck crash injuries could change your life, and you deserve compensation to put your life back together. Filing an injury claim may be the only way to receive compensation, but it’s not easy. You may need an attorney on your team to help you win your case. 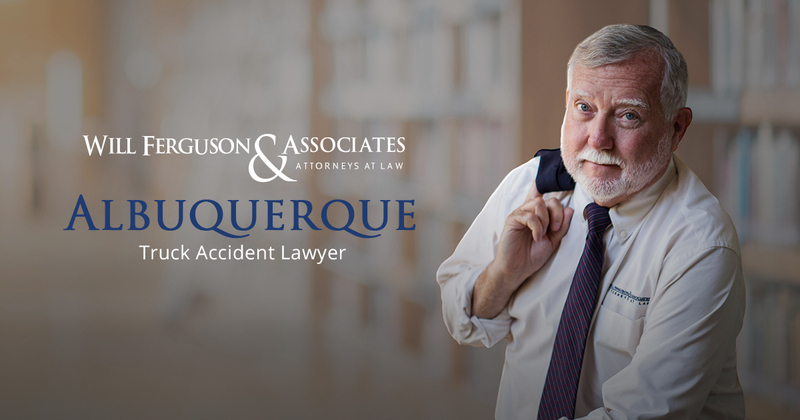 Reach out to an experienced and aggressive Albuquerque truck accident attorney at Will Ferguson & Associates. A free consultation is yours when you fill out the online contact form at the bottom of this page or call our office directly at 505-243-5566.